South Africa and Botswana will contest the AUSC Region 5 Games Women’s Under-20 competition trophy after they won through to Saturday’s final with two hard-fought victories in the semifinals on Thursday. Host Botswana will hope to keep the trophy in the country after a tense 1-0 victory over Namibia, much to the delight of the home crowd. The only goal of the game was scored in the 32ndminute by Esalenna Galekhutle, with Botswana able to keep their opponents at bay for the remainder of the game, though not without a number of alarms. Home goalkeeper Bame Mokime had to pull off a string of excellent saves in what was a fine performance from her. 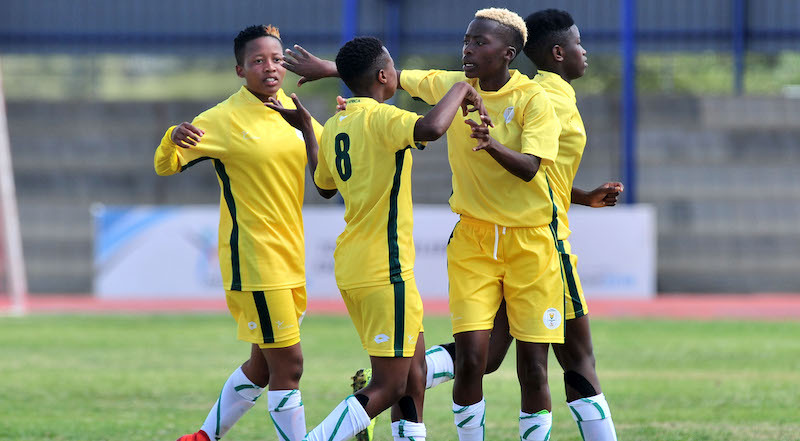 Defending champions South Africa sealed their place in the final with what proved a comfortable 2-0 victory over Zimbabwe at the University of Botswana Stadium. Lelona Daweti scored both goals for the victors, the first late in the opening period and the second with 20 minutes to play. South Africa played with a pragmatic approach, allowing Zimbabwe to commit themselves forward and then hitting them with quick transition play that was difficult for their opponents to handle. South Africa won this trophy two years ago with a 5-0 success over Namibia in the decider, but are unlikely to get such a comfortable ride this time round. The Men’s Under-17 semifinals will be played on Friday and should be two more mouthwatering fixtures. Tanzania will host Zambia in the first fixture at 14h00, with the latter hoping to make up for a disappointing COSAFA Under-17 Championships that was played in Maurtius in July when they failed to get out of their pool. The second semi pits Eswatini against the COSAFA champions Angola, with the former having been the only side to come through the pool stages with three wins. Eswatini have yet to concede a goal, let alone give up points and they will feel confident of winning a place in Sunday’s final.